Researchers say Home Office 'Security and Policing' event aims to boost arms industry and promote militarisation of border controls. The UK government is hosting an invite-only international « security » fair that will help arms companies profit from the militarisation of European borders, experts say, as the EU attempts to control hundreds of thousands of people fleeing war in the Middle East. The three-day, Home Office-organised Security and Policing 2016 fair, which started on Monday near a military base in Farnborough, features more than 350 companies including weapons manufacturers BAE, Airbus and Heckler & Koch selling to EU and foreign governments. Researchers say the event proves the UK government’s interest in profit over human rights, and entrenches a decades-long policy of militarising what is essentially a humanitarian issue: the most severe refugee crisis Europe has experienced since World War Two. According to the event’s website, the fair is “unique » thanks to the UK government’s direct involvement, and provides a high level of “industry engagement” for firms that are marketing equipment “that would be too sensitive to show in a more open environment”. Those attending must be vetted by the Home Office, which promises “quality visitors », and reports that sales were boosted for 83 percent of exhibitors at last year’s event. Previous Security and Policing events have showcased everything from high-powered sniper rifles to traffic cones. The fair includes specific areas dealing with border control, cyber security and maritime policing. Martin Lemberg-Pedersen, a migration researcher at the University of Copenhagen, told MEE that European governments were helping “fund their own military industry” by organising such trade fairs, and promote harsh, reactive policies to deal with the refugee crisis. “The technological infrastructure of border security is an area that traditional military companies are jumping into, while security companies are chasing contracts for border enforcement,” said Lemberg-Pedersen. In attendance will be multinational arms giants that produce weapons for export to countries in the Middle East, which buy more than 60 percent of UK-made weaponry according to Campaign Against Arms Trade (CAAT). « In 2015 the UK government held meetings with 39 countries that attended the fair, with a clear emphasis on the Middle East, » said Andrew Smith, a spokesperson for CAAT. Responding to MEE’s queries about its reasons for organising the Security and Policing event, the Home Office said that « a thriving security industry is vital to help cut crime and protect the public ». A spokesman said that « national security is the first priority of the government ». But with arms sales to Europe down by more than 40 percent over the past four years, according to a report by the Stockholm International Peace Research Institute last month, researchers say these same firms are increasingly focusing their European sales efforts on the burgeoning “border security” market – projected to be worth an annual $56.6bn worldwide by 2020, according to a 2014 study by market research firm Frost & Sullivan. Among the products on display at the 2015 incarnation of the fair – which has been running for three decades – were sound blasters that can disable targets from a distance of 20 metres, and biometrics systems that allow staff at immigration detention centres to monitor the movements of detained asylum seekers moment by moment. The firms attending this year’s fair include dedicated security companies specialising in strengthening technological and physical borders, as well as arms companies looking to expand their market share in the border security industry. One of the exhibitors at this year’s fair, BAE Systems, is involved in a controversial deal to sell fighter jets to Saudi Arabia, a key export market for UK arms that is subject to a call for an EU arms embargo over its bombing of Yemen. BAE Systems also manufactures the Herti drone, whose armed variant known as Fury has flown over frontlines in Afghanistan. The Herti airframe is marketed for both “battlefields and borders”. The Civil Aviation Authority, the government body responsible for airborne vehicles in the UK, has said it is keen to see such drones integrated into “the routine work…of border authorities”. Another exhibitor is Airbus, which won contracts to secure Saudi Arabia’s borders in 2009 and Romania’s in 2004. Last year, the French company’s Munich offices were raided by German police investigating claims of bribery and tax evasion relating to bidding for these contracts. The investigation is ongoing. 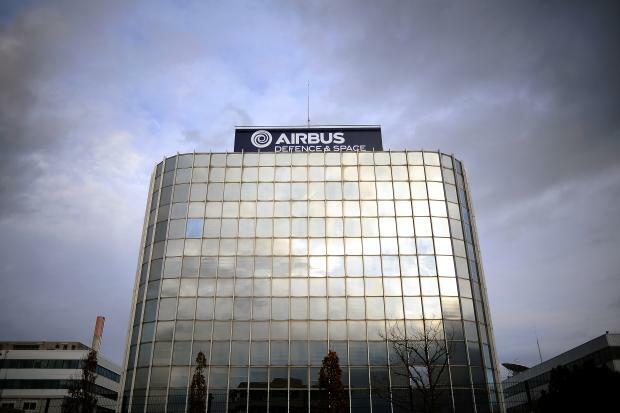 Airbus remains a key player in an EU lobbying group that briefs European governments on how to improve border security. The European Organisation for Security (EOS), based in Brussels, is a 38-member body that represents the interests of leading security firms from across the EU. With a key policy focus on border control, EOS has briefed the Italian and Greek governments on maritime border security, urging them to enhance coordination between civil and military branches. Six of EOS’s members are attending the UK’s Security and Policing fair, including Finmeccanica, an Italian firm that according to its website provides “military systems for border control”. In 2009 – the same year that it signed a $441mn deal with the government of Muammar Gaddafi to secure Libya’s borders – it received a $550mn loan from the European Commission and European Investment Bank to produce aeronautical components for use in border-control aircraft. Another EOS exhibitor is Smiths Detection, which has received European Commission funds to develop new ways to scan vehicles at borders. These firms are among the 354 companies that will be hoping to sell security equipment to countries including Austria, Bulgaria and Poland. All three EU members sent delegates to the fair last year, and are now at loggerheads with Brussels over their attempts to close their borders in the face of the latest influx of asylum seekers. The EU’s far-reaching involvement in the funding and purchase of border security equipment is, said Lemberg-Pedersen, the result of decades of policy focused on militarising borders at the expense of providing safe routes by which to seek asylum. The outcome of this approach can be seen, Lemberg-Pedersen said, at the EU’s external borders, with the unprecedented decision last month to deploy NATO in the seas between Turkey and Greece. NATO, the transatlantic military alliance that includes France, the US, Greece and Turkey, has deployed dozens of warships to the Aegean Sea to target people smuggling operations – the vessels will also share information with the Turkish and Greek coastguards. According to Lemberg-Pedersen, the status quo at the French port of Calais shows that the militarisation of the EU’s external borders also has startling ramifications for hotspots within the union. Since at least 1999, groups of asylum seekers – originally fleeing the Balkan wars – have camped in squalid conditions near the Calais port, hoping to make it through the Channel Tunnel and into the UK. 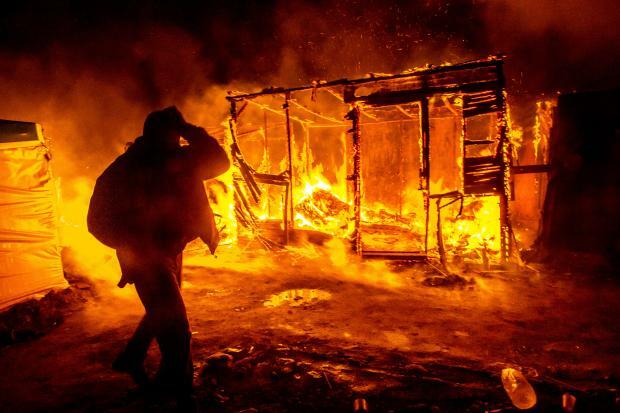 After years of squabbling between the UK and France over how to deal with the camps, and with the number of people staying there topping 3,000, matters came to a head early this month when French police moved in to raze the temporary shelters, deploying tear gas and water cannons. “The Calais border as it is now is a result of the decision to boost border control by funding private companies rather than talking about how we can implement a sustainable reception system,” Lemberg-Pedersen said, warning that while states have signed up to the UN Refugee Convention, private companies hired by those same states are less accountable. Security efforts have been focused on the entrance to the Eurotunnel, which links the UK and France. Last summer, when as many as 1,500 people were attempting to break into the tunnel every night, the UK government said it would pay for 200 private security guards to secure the entrance. Later that year, the British firm Jacksons Fencing – an exhibitor at Security and Policing 2016 – won a contract to supply 8.5km of high-security fencing around the entrance to the Eurotunnel near Calais. Attempts to ramp up security have focused on installing a total of 22km of NATO-grade fencing and razor wire around parts of the track where trains move at below 50km per hour, counting on the fact that people will not attempt to jump onto vehicles moving above these speeds. The government also pledged in July to give Eurotunnel a $10mn aid package to boost security at the site. In the three months after the UK government announced its funding boost for Eurotunnel – a period when several people died trying to cross the tunnel – the company announced a three percent profits jump. Over the course of 2015 the firm’s revenues jumped by five percent to €1.2 billion ($1.3 billion). Announcing the profits jump, company CEO Jacques Gounon credited the “support of the British and French governments” for helping Eurotunnel grow its profits “despite the migrant pressure”. Last week UK Prime Minister David Cameron pledged an extra $22mn to France to support police efforts to stop people without correct documents from entering the UK, although it was not clear whether any of these funds would be given directly to Eurotunnel.